Daily open from 8:00 a.m to 23:00 pm. Make your wash with soap and pH neutral Softener. Unique in the market, at a very affordable price. 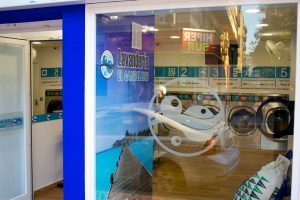 Ecological central laundry in Fuengirola. It provides washing and drying of industrial and personal clothing. Local and Home collection – delivery service in the area of Fuengirola , Los Boliches and Mijas Costa. Please contact us for other locations . Washing is performed on machines with capacities of 12 and 15 kg and an average of 40 minutes. The detergent used is completely ecological and environmentally friendly as well as being neutral pH which is highly positive for people with delicate skin or dermatitis. 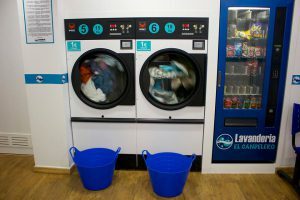 It is not necessary to bring any detergent or fabric softener, the detergents as are included in the price of the service and are automatically added . We have a drying service available in the same place. Our machines have a capacity of 15kg of clothes at 40 °, 60 ° and 80 °C temperature depending on the delicacy of the clothes , which facilitates the whole washing process in the local. Copyright © 2019 Lavanderia El Candelero | Creada por Jonatan Rosales. All rights reserved.